I am fortunate to have a large garden with about 4,000 sq. ft. of bed space, not counting paths. My plantings include grains and cover crops and when I take a notion to add something else of interest, I can usually find space with careful management. Recently I had been wondering what people choose to plant when they have very limited space, such as in a community garden. 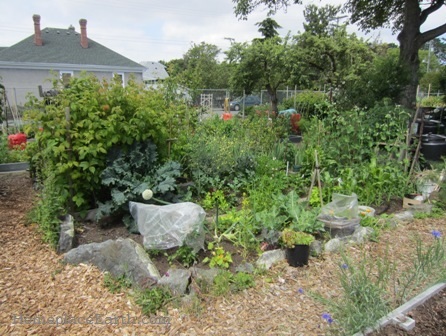 I had the opportunity to get a close look at community gardens on our recent trip to Victoria, British Columbia. We were on the West Coast for the Mother Earth News Fair in Puyallup, Washington on May 31-June 1. Wanting to make the most of that trip, my husband and I traveled to Victoria for a few days and had a wonderful time. We stayed at the James Bay Inn and were within walking distance to almost everything we wanted to see, including the Victoria Public Library that hosts a new seed library. The first community garden we visited was the Michigan Street Allotment Garden. It was a picture of abundance! The perimeter was a wall of raspberries and the beds were overflowing with produce, flowers, and sometimes fruit. You could feel the good energy just by being there. There were about 20 garden beds, each measuring about 4’ x 16’. Their garden shed was a cob structure. That was great to see. I had a nice conversation with Jill, one of the gardeners there. She was enjoying the evening in the garden in her motorized chair reading a book. Her garden bed looked terrific. She told me that the garden had been there for many years, but this would be the last. The property was being sold for development. That was pretty sad to hear. Unfortunately, it is the plight of many gardens that have been allowed to flourish on empty lots. On the bright side, there are plans to make space available elsewhere in the community for the gardeners. The next garden we visited was the James Bay Allotment Garden which has 54 plots. It was right next to a community baseball field. There is a four year waiting list for space there. A plot costs $50 per year and the spots were bigger than the ones on Michigan. There is equipment in a shed for all to use. There were some seeds in the shed, creating an informal exchange. Some of the plots, but not all, had fences around them. I’ve included a photo of a garden plot with a fence so you could sense how large it was—sorry, I didn’t record the size. 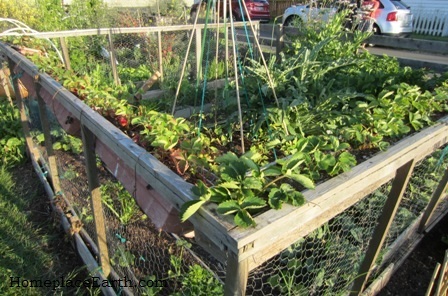 Notice the plastic boxes wired to the top of the fence that hold strawberries. Besides strawberries, some plots had blueberry bushes in them and I may have seen a fig tree there. I know I saw figs somewhere. There were creative trellises and season extension devices in all the community gardens we visited. We went to the Fernwood Community Garden which was right next to the Victoria Compost Education Center. Most of the 34 garden plots there had wood borders, but the one in this photo had a border of stone. Raspberries can be seen in the corner to the left. I saw raspberries in many garden plots, except for the ones on Michigan Street, of course, since they already had a community hedge of raspberries. In all the community gardens I saw fava beans growing—flowering or already with pods thick with seed. Victoria has a milder climate overall than Virginia, but cool nights throughout the summer. In Virginia the temperature had already gotten sufficiently high to cause fava blossoms to drop by the first week in June. Sugar snap peas were also a popular crop in the gardens. Tomatoes were often in season extension structures because of the cool nights. They need the heat to make them tasty. That’s not a problem in Virginia. The last community garden was the largest. The Agnes Street Community Garden has been in existence for over 40 years and has more than100 garden plots. Most plots are 20’ x 50’, giving the gardener 1,000 sq. ft. to play with. In the other gardens I saw chairs and compost bins within the plot space. Those things were here, also, with the addition of greenhouses in many gardens. 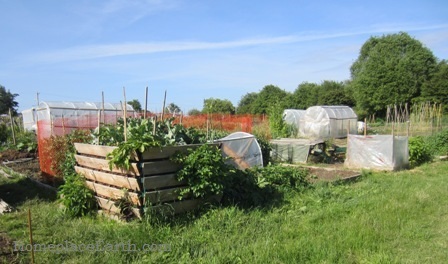 I chose this photo to represent the Agnes Street gardens because it showed the numerous greenhouses and to show the compost bin on the corner of a garden plot. I don’t know if it was intentional for plants to be growing out the sides in the openings of the enclosure, but I couldn’t help wonder how many potatoes could be grown in there. You could build a large compost pile in the fall that would need to be cured through the next summer. In the spring you could tuck potatoes into the openings of the bin and let the plants grow out the sides. You would need to dig out the compost to harvest the potatoes, but that might be a good time to move the compost out of that bin to see what you have anyway. Then the bin would be available to start a new pile, or to be moved to a different location. 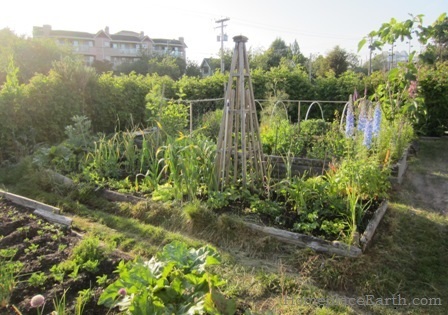 The land for this community garden is leased by the Agnes Street Gardeners’ Association from the Municipality of Saanich and is administered by the Saanich Parks Department. According to their website, there is a $10 membership fee and a yearly charge of $60 per year for a full plot / $30 per year for a half plot. A monthly meeting is held that, although open to all members, is usually attended by about a dozen. It is an opportunity for exchange of information and seeds and plants. The gardeners I talked with all said they learned from the other gardeners and and enjoyed the interaction. Although many of the gardeners are retired, I talked with two women in their garden plots who had young children. With the pathways clearly marked, the children can enjoy the space and experience their parents and others growing food for their tables. We only had time to visit four, but there are community gardens all over Victoria and you can find the list here. Wouldn’t it be great if every city had such a list? We had a wonderful time in Victoria—and I haven’t even told you about the seed library yet! If you are traveling and want to avoid the tourist traps, I highly suggest finding out where the community gardens are and meeting the locals. You will find new friends in the gardens. Thank you to my new friends, who I met in the gardens in Victoria, for making our visit so pleasant.